Brazil’s second largest carrier Gol recorded mixed fortunes during 1Q2013 as its overall losses widened year-over-year but yields and unit revenues improved at what appears to be at the expense of load factor. After recording annual losses for the last two years Gol is hoping an aggressive capacity reduction in the Brazilian domestic market place and a significant reduction in its workforce will help the carrier slowly improve its fortunes. But Gol faces challenges in achieving its turnaround as company management believes it is uncertain that Brazil will record 2.5% GDP growth in 2013 while inflation is rising. The carrier feels positive about its position heading into the slow season in South America, but the timing of a full recovery for the carrier seems far from uncertain. Gol’s BRL75 million (USD37 million) loss during 1Q2013 widened from the BRL41 million (USD20 million) recorded the year prior, owing to the familiar challenges the carrier has outlined throughout much of the last year – a 12% depreciation of the Brazilian real against the dollar, a 10% increase in airport fees and a 14% rise in fuel costs. Carrier management remarked that the price per gallon Gol paid for fuel during the quarter was the highest in the carrier’s history. 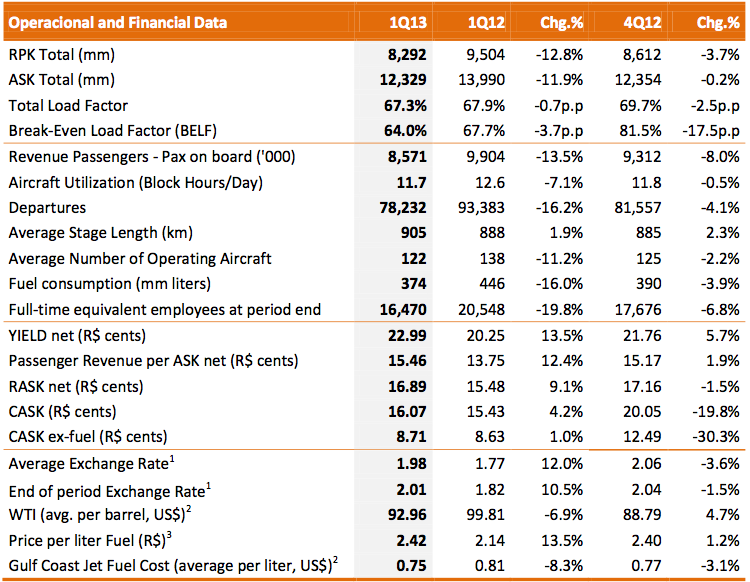 Even as top-line revenues fell nearly 4% year-over-year to BRL2 billion (USD993 million), Gol’s 8% drop in overall operating expenses to BRL2 billion (USD993 million) helped drive a positive operating result, as the carrier’s operating margin grew 4.5ppt year-over-year to nearly 5%. Accompanying Gol’s favourable unit cost performance during 1Q2013 was a 9% increase in unit revenues and a 13.5% rise in yields. Company executives in discussing the carrier’s 1Q2013 performance on 14-May-2013 indicated its quarterly results reflected Gol’s efforts during the last year to re-size the company for the new operating environment in Brazil. After explosive double-digit growth up until about the beginning of 2011, Brazil’s aviation industry has slowed considerably. During 2010 traffic in Brazil’s domestic market grew by 23.5%, dropping to 15.9% growth in 2011 and a 6.8% traffic increase in 2012. During 1Q2013 data from ANAC show that Brazil’s domestic traffic fell 1.2% year-over-year. Since taking action to shed about 130 flights beginning in Mar-2012, Gol has continually touted its stature as most prudent airline among Brazil’s carriers with respect to capacity management. 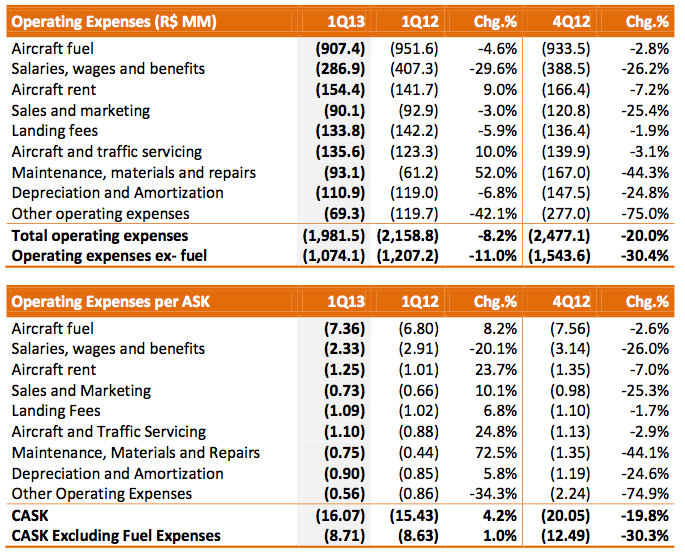 The company estimates its domestic ASKs fell by nearly 16% year-over-year during 1Q2013. After battling weaker yields for most of 2012, with overall yield growth of just 1% for the year, Gol beginning in Jan-2013 saw an upswing in yields with 8% year-over-year growth for the month and a 17% increase in Feb-2013, which contributed to Gol’s robust yield growth for 1Q2013. Previously, Gol management has explained the favourable yield performance in Jan-2013 and Feb-2013 was attributable to stronger pricing at the end of the high season than in the past and the Carnival holiday occurring in early Feb-2013. But while Gol has been more aggressive in cutting supply than its main rival TAM and the still-growing regional carriers Azul and TRIP (who are in the process of merging), it has given up market share and seems to be sacrificing loads for yields. Its 67% load factor was essentially flat year-over-year, but higher than the 64% break-even load factor, which dropped 3.7ppt year-over-year. Yet Gol’s average load factor during 1Q2013 was well below the approximately 80% recorded by Brazil’s three other major airline groups TAM, Azul and TRIP, and Avianca Brazil. Even with its strong yield growth it is tough to imagine that with loads that far below the industry average it will get its revenues up to the necessary levels to turn its fortunes around. Gol’s market share in the Brazilian domestic market fell 6ppt year-over-year during 1Q2013 from 41% to 35%. Acknowledging that the ideal scenario would be a rise in unit revenues while keeping load factors stable, Gol CEO Paulo Kakinoff stressed the carrier has no interest in starting or re-igniting a fare war in the Brazilian domestic market. Gol’s wrestling with the need to strike the delicate balance between loads and yields, and trading the former for the latter, illustrates the tricky dynamics currently transpiring in the Brazilian domestic market place. At the same time Gol’s loads are lagging, the economy is Brazil is showing few signs of improvement. The carrier’s management is warning that the country’s GDP growth is in danger of failing to reach the lower end of current estimates of 2.5% to 3%. In some ways the continued sagging economy could be beneficial to Gol in the short run; its aggressive capacity cuts will result in the carrier having less exposure to the declining market conditions. But on the flip side Gol will sit in an unenviable position when the economy improves, as it will be difficult to spool up quickly when demand strengthens. Gol is still sticking to its forecast of 10% or better unit revenue growth for 2013, but concludes the increase for the current slower demand period will likely fall in the single digits. As Brazil’s economy has slowed during the last couple of years, Gol in some ways is forced to quickly abandon strategy of a singular focus on the Brazil domestic market. Starting in 2012 it reversed course and in Dec-2012 re-launched service from Sao Paulo and Rio de Janeiro to Miami and Orlando with Boeing 737-800s with a stop over in Santo Domingo, Dominican Republic. Gol had previously served the US with direct flights operated by 767 widebodies, but the operation proved to be unprofitable. Gol operates daily flights from each of its Brazilian hubs to Santo Domingo for daily service onwards to each destination in Florida. Since re-launching service to the US in late 2012 through Santo Domingo, Gol has re-timed its flights to foster better connections at its Rio and Sao Paulo hubs, and is working to establish a subsidiary in the Dominican Republic to support the creation of a hub in Santo Domingo for possible increased service to the US, Central America and the Caribbean. Mr Kakinoff remarked the performance of those flights after five months is encouraging, and indicated additional destinations would be introduced during 2H2013. He remarked the government of the Dominican Republic is providing Gol with positive feedback regarding its expansion plan. But as CAPA has previously stated, even with better timed services and building scale in Santo Domingo, competition is intensifying in the US-Brazil market, spurring overcapacity and lower fares on non-stop flights. All of those factors will make the one-stop offering by Gol less appealing. Gol should enjoy some uptick from an enhanced codeshare with Delta Air Lines, which also has an equity stake in Gol. The new agreement has a six phase implementation that begins with codesharing on Delta’s flights between Atlanta and Brasilia. Gol will sell Delta’s tickets on flights from the US to Brazil through all its sales channels. Through Aug-2013 Gol’s flights from Goiania, Belo Horizonte, Curitiba and Porto Alegre through Brasilia to Atlanta are scheduled to be added to the new codeshare agreement. It is not yet clear if Gol's one-stop service to the US will eventually be folded into the partnership. 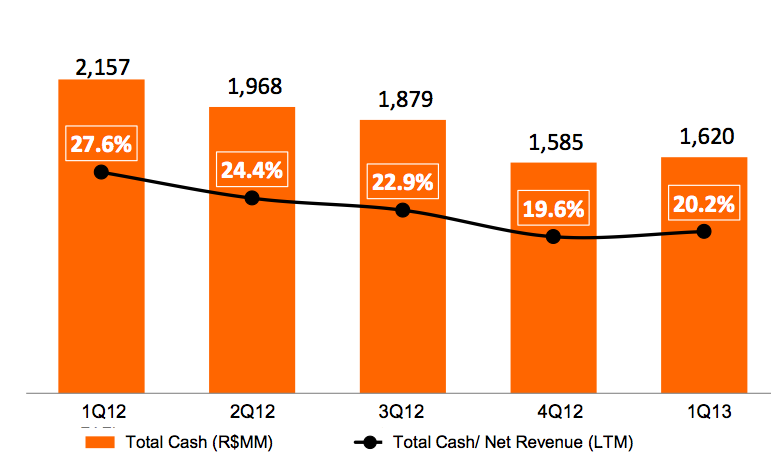 At the end of 1Q2013 Gol’s BRL1.6 billion in cash represented approximately 20% of trailing 12 months revenue, which is a weaker position from a year ago. But the spin-off of its Smiles frequent flyer programme completed in Apr-2013 should bolster the company’s cash position, which will result in the company’s long-term debt and cash position almost being equal at BRL3 billion (USD1.5 billion), which will improve its leverage ratios. While Gol has taken measures to improve its financial standing during the last couple of years as conditions have deteriorated in Brazil’s domestic market, it still remains unclear when the carrier will complete its turnaround as its net loss widened during 1Q2013 and prospects for a quick rebound of Brazil’s sagging economy dampen. Even as some of its financial metrics have significantly improved year-on-year, the macro conditions that have pressured Gol’s earnings during the last year – currency fluctuations, fuel cost increases and airport fees – show no immediate signs of retreating. The result is Gol remains in a precarious position as it tries to assure investors its fortunes will improve while the uncertain dynamics in its home market show no signs of turning positive.